HOUSING Minister Simon Coveney has said this evening should Leo Varadkar win the Fine Gael leadership he would shake his hand - and maybe even give him a hug. He made the comments as he insisted his Fine Gael leadership campaign will continue despite the major gains made by his rival Social Protection Minister. "A lot of the (Fine Gael) middle ground don't want to get caught out. They say 'we want to be on the winning side.' 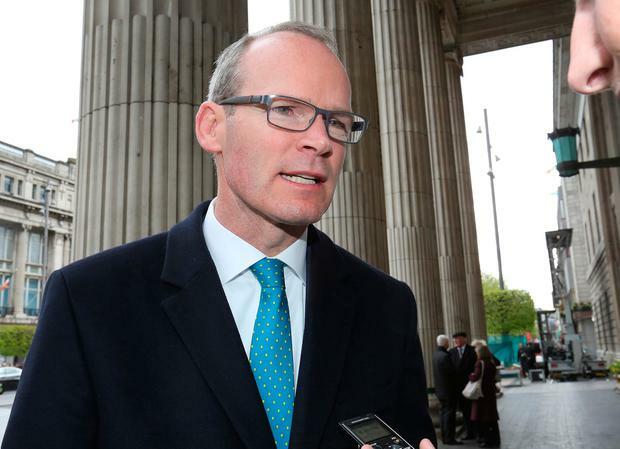 That is what we have seen in the last 48 hours," Mr Coveney said. "That is not a criticism of my (parliamentary) colleagues. Because people do have to make choices. Everyone of my colleagues are being followed to their cars by journalists." "Being put under pressure to say who they are going to declare for." "Good luck to them and well done to Leo in the last couple of days." "But this process for all of us, as party members and public representatives, still has a long way to travel." "When this process is over, and completed in full, if Leo Varadkar (does) win out, and he is chosen to lead this party, then fair play to him," Mr Coveney said. "I will shake his hand - I might even give him a hug." "I will wish him well and I will work with him as I hope you will to ensure that this party is stronger at the end of this process not weaker. To ensure that this party is more united than ever at the end of this process rather than divided - because, believe me, if there is any other outcome to this process this party will not do itself justice in the context of the leadership process that is now underway. "Let me be equally clear - we are not done just yet," Mr Coveney vowed. "This isn't just about the future of our party - this is about the future of our country." "It is about creating a new vision for our party and our country." The Cork TD dismissed media reports that he would end his campaign as Mr Varadkar opened a commanding lead with the support of 45 members of the Fine Gael parliamentary party and most senior members of the Cabinet. Mr Varadkar now effectively has 40pc of Fine Gael electorate support - and is within sight of confirming himself as successor to Taoiseach Enda Kenny. Mr Coveney made the vow to fight on as he attended a campaign rally at the new multi-million Euro Capitol complex in Cork city just hours after he cancelled an afternoon media briefing in his Carrigaline, Co Cork constituency base. That briefing was cancelled shortly after Tánaiste Frances Fitzgerald confirmed that she would be supporting Mr Varadkar. Arriving at his rally with his wife, Ruth, Mr Coveney insisted it was vital the party's 21,000 members now have a say in Fine Gael's future direction. "This is just the start of a process I am looking forward to," he said. "We are going to make a very strong statement this evening." "This process is just getting underway - there are 21,000 people that will have a vote in two weeks time are going to be getting involved from now on." "I am looking forward to facilitating that." "There are no second thoughts - that is not my style." "We are going to finish what we started in this process." However, the Cork South Central TD's leadership campaign was left reeling over the past 24 hours by the strength of Fine Gael parliamentary support wielded by Mr Varadkar. Cabinet heavyweights including the Tánaiste, Public Reform Minister Paschal Donohue, Education Minister Richard Bruton and Foreign Affairs Minister Charlie Flanagan all backed Mr Varadkar. Chief Whip Regina Doherty has also backed the Dublin TD. Mr Coveney, who has the backing of Health Minister Simon Harris, suffered a further blow when the expected endorsement of his fellow Cork TD and Agriculture Minister Michael Creed failed to materialise. Mr Creed is not now expected to publicly back any leadership candidate. Mr Coveney spent the afternoon lobbying and consulting with local councillors who now offer his best chance of a comeback in the race. He also took soundings from Fine Gael party members. Key supporters admitted that matters have significantly changed over the past 48 hours. Mr Coveney has repeatedly warned that the campaign to elect a new Fine Gael leader should not be allowed prove fractious or threaten to generate divisions within the party. Some are now concerned at the media headlines generated by comments from key Coveney supporter, Kate O'Connell TD, where she described Mr Varadkar's supporters as "choirboys" at a private event in Clare. European Affairs Minister Dara Murphy, a key Coveney supporter, insisted that the campaign could still take a twist. "We have a big parliamentary party. We have a large number of councillors and the largest membership of any political party in the country." "Of course our electoral system allows our 21,000 members and our hundreds of councillors to also have the opportunity to contribute to this." Senator Buttimer said while the parliamentary party vote was important, the party's councillors and their 21,000-strong membership could still prove vital.